This weekend, photo-editing service Aviary and Facebook hosted the fourth Photo Hack Day event. Hundreds of developers gathered at the social network company’s Menlo Park headquarters to compete for cash prizes and other assorted rewards. After nearly two days of hacking, there were 63 different results. While we were able to participate in the event judging, we thought it would be great to also take a look at some of the ones we thought also looked interesting. It was a great honor for me to be selected as one of the five judges to evaluate the different hacks that presented at Photo Hack Day 4. Alongside myself, was Bessemer Venture Partners’ Kristina Shen, Maverick Venture Partners’ Eric Kim, Shutterstock’s Brent Baisley, and TechCrunch’s Drew Olanoff. Hackers had the opportunity to create something that revolves around the use of photos and could take advantage of one or more API service companies there, including Chute, Walgreens, Shutterstock, Sincerely, Filepicker.io, Windows, Imgur, Foursquare, and more. First place: Letsgo.io — this service functions as a very photo-centric version of Google Maps, although it’s powered by Bing Maps. Users can enter their initial and final destination and Letsgo.io will display photos from Getty Images and other sources to give you a more visual experience. Second place: Snapsplosion — an iPhone app that creates a photo mosaic from your own photos, the user takes a picture and the app will find thousands of other photos nearby and creates the final output, a nice mosaic. Third place: iMaze — a Web application that allows people to take an image and create a maze that has two modes: single-player or head-to-head competition. Crowd favorite: Cardified — a service that creates invitation cards with customized text and photos automatically from your Facebook graph. With each friend, the application automatically searches for photos with both the sender and the receiver to create a personalized card that’s addressed to the receiver. While there could only be four official winners, I was very impressed by what people could come up with with less than 48 hours to work. And it wasn’t easy for people to present their ideas either as the organizers gave each team just two minutes to demo their concept. It should also be noted that this hackathon event also included participation by the sponsors as well — some of their employees created their own hacks, which were impressive as well. Created by an Aviary employee, this iOS app is a very visually appealing photo-editing service that allows photographers to compare their photos before and after it’s processed. Something that everyone will probably be begging for in the future, Billie is an iPhone app that helps people better split the bill when out in groups. By photographing the receipt, users can tap on individual items to tag a person to it and the app will automatically tell them what portion of the bill they need to pay. Akin to Siri, this app uses voice recognition to understand tasks, such as opening up folders or files, and even popping open Aviary to make photo edits. An interactive photographic darkroom, it functions very similar to what users would have in Adobe Lightroom or Aperture. It’s based on analog cameras and allow anyone to process their photos in an environment of an old-school darkroom. This iPad app compiles photos and allows users to create music simply by touching the image. Created by Chute, this app allows Instagram users to share their photos to charity, including the American Red Cross, Feeding America, and more. This is a pretty entertaining service. It’s billed as transforming text into a shareable piece of art which means that if you input text into the app, it will display the response, but using photos in place of the word. For example, if the input has the word “bacon” in it, Rebus will display an image of bacon that it pulled from the Internet. This application functions almost like a mobile dashboard for your photos. It not only displays photos of places where you’ve been, but also sorts it by time so you know when you’ve taken and shared them the most. Photo Hack Day first started as a means to help developers and designers to create applications using Web and mobile APIs. 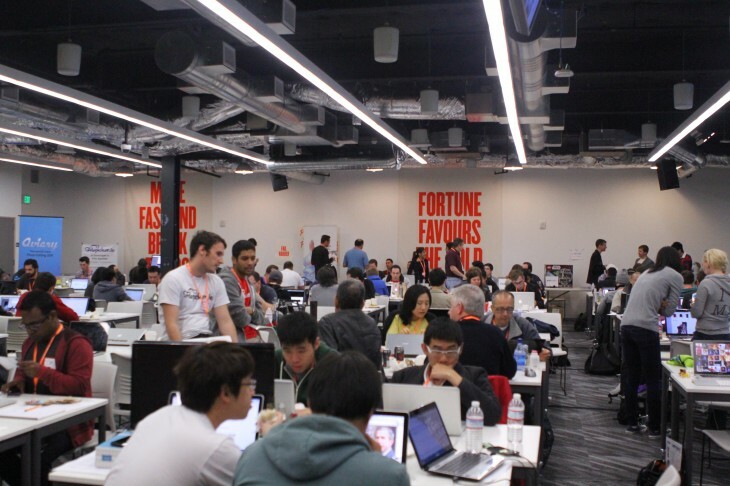 This is the fourth event under its belt and each time, dozens of apps are created — the first event had 43 hacks while the second had 58, with 72 in the third edition. Each event is held in a different venue and city.